The following are brief definitions and examples of the English-language haiku genres: haiku, senryu, haibun, haiga and tanka. Stephen Addiss' "A Brief History of Haiga." Haibun: A haibun is a mix of prose and one or more haiku. The title, prose and haiku work together to form the spark of this form. The prose is typically succinct, almost haiku-like. The focus of the prose can be on a travel experience or a smaller, more discrete human experience. Some modern writers include fantasy, dreams, remembrances as their subjects. A related form is Tanka Prose, which is a mix of prose and one or more tanka poems (and sometimes mixed with haiku poems). I miss them, my daughters when they were young. Reading The Hobbit in wintertime, snuggled in close, bodies and fire keeping us warm, rewarded with their pleas . . . just one more page, please Dad! I've nearly forgotten my reluctance to pick up the book in the first place. I don't remember being read to, but when I was sick, my mother sang lullabies while tucking me deep under the covers, only my nose and ears sticking out. I remember the melodies, but not the words. Haiga: Modern haiga are a mix of image and haiku poetry. The haiku may be placed on or next to the image. Haiga artists utilize a variety of mediums: drawings, paintings, photography and digital-art. Just as the haiku in haibun serves as a link to and contrast with the prose in a haibun, so does the haiku in haiga compositions work to create the spark that makes haiga work and that differentiates it from pure artwork. 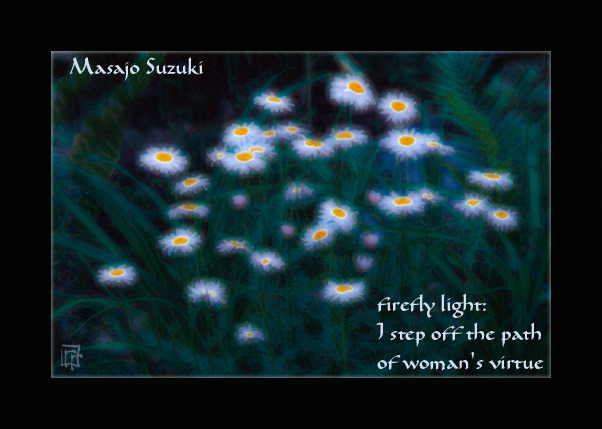 Example: haiku by Masajo Suzuki, composition and digital artwork by Ray Rasmussen.